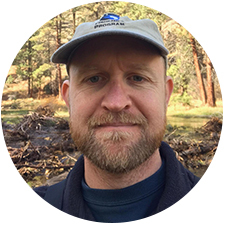 Jason Wilcox is the Forest Fisheries Biologist for the Deschutes and Ochoco National Forests and the Crooked River National Grassland. Prior to moving to the Eastside, Jason served as a Forest and District-level fisheries biologist for the Umpqua and Siuslaw National Forests, where he applied his education from Humboldt State University toward extensive riparian and instream habitat management and restoration in wet temperate forests. After observing recent wildfire threats to fish populations in SW Oregon, he is interested in managing for fire resilience in riparian areas of dry forests. The number of fuels reduction and thinning projects that include riparian area environments is increasing across the Western United States, bringing new challenges to riparian area management. Many of these project treatments are needed to maintain riparian biodiversity and restore valued functions of riparian area environments, while protecting them from catastrophic wildfire, disease and insects. Restoration is needed largely in response to legacy effects such as fire suppression, land use and other human disturbance. Riparian areas are protected by administrative regulations, such as the Clean Water Act, but others which are largely custodial and restrict active management. In this presentation we discuss how the Deschutes and Ochoco National Forests have been working with the Oregon Department of Environmental Quality to get conditional approval letters for riparian area treatments that may reduce shade. Generally, the anti-degradation clause of the Clean Water Act does not allow for short term effects greater than 6 months. However, these conditional approval letters have recognized there may be short term effects (longer than 6 months) for long term net ecological benefits. Topics: Managed Fire: A tool or a Hazard? An in-depth discussion with the Lakeview Forest Stewardship Group. Topics: Roads, Crossings and Culverts, Low-cost approaches to Low-Volume Roads and Water Crossings, Prioritizing Roads, Crossings & Culverts with NetMap. Featured Speaker: Do Collaboratives Matter in Litigation? Enjoy one of the many area dining options at your leisure. © 2018 Central Oregon Forest Stewardship Foundation. All rights reserved.